When those in Tustin want to buy quality, brand name patio furniture, umbrellas, bar stools, barbecues, fire pits, gas logs, and more the best prices in Orange County, they come to Patio Place. In business since 1989, we have cultivated long-standing relationships with leading outdoor furniture manufacturers and negotiated the lowest prices on new, off-season, and closeout patio furniture from the brands you trust most. And, with our years of experience, we have the expertise required to offer knowledgeable advice for everything we sell, from choosing the right color cushions for your outdoor furniture to suggesting the right size furniture for your outdoor space in Tustin. We also offer affordable, professional cleaning services for your outdoor furniture, as well as skilled patio umbrella repairs, barbecue parts replacement, custom replacement cushions and pillows, patio furniture frame refinishing, and custom replacement slings (for patio chairs and chaise lounges). With knowledgeable recommendations, same-day delivery, and value pricing, it's no wonder that we've become the preferred choice among thousands of customers in Tustin and the greater Orange County area. Call or visit us today to learn more. We're an authorized dealer for the market's most-respected names, including Alu-Mont, Firemagic, Galtech, Gensun, Hanamint, Patio Renaissance, Rattana, NorthCape, Sunbrella, Sunset West, Telescope Casual, Treasure Garden, R.H. Peterson, and others. From Mediterranean decors to rustic outdoor settings, we have solutions to suit every Tustin patio, poolside, deck, terrace, garden, backyard, or other outdoor area for prices that can accommodate most budgets. Call today. We provide Tustin with a wide variety of high-quality patio furniture from top brands. Stylish, comfortable, durable, and competitively priced, our patio furniture is available in beautiful aluminum, cast aluminum, and wicker styles. 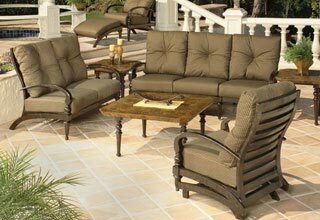 We stock a huge selection of individual patio furniture pieces, such as swings, benches, patio tables, and patio chairs, as well as attractive patio dining sets, patio lounge sets, and more. Our patio furniture is available at the best prices in all of Orange County, including Tustin, so visit us today. You can be sure that we provide Tustin with the best deals on quality, brand name patio umbrellas from leading manufacturers, such as Galtech, NorthCape, and Treasure Garden. Our large inventory includes many of last year's models and close outs that are available for up to 50% off the original sales price. 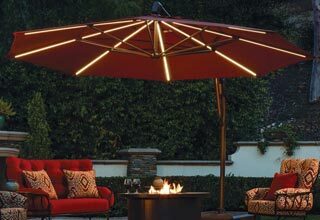 We sell auto tilt umbrellas, cantilever umbrellas, easy track umbrellas, push-to-tilt umbrellas, side-post umbrellas, and umbrellas with lights, as well as umbrella bases in various weights, and umbrella lights in LED, solar-power, and plug-in models. 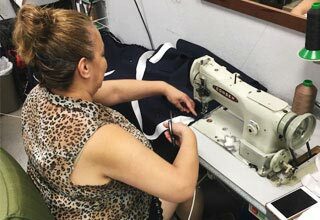 We can customize your Tustin umbrella to feature a monogram or your company's name or logo, and can repair damaged umbrellas with our recovering, restringing, and rib replacement services. Learn more today. Patio Place offers those in Tustin incredible deals on brand name fire pits, fire tables, and bar stools. Our fire pits and fire tables will enhance any outdoor space as they come in countless styles, heights, sizes, and shapes. We also carry a wide selection of quality bar stools, which are available in wicker, extruded aluminum, and cast aluminum styles. Our bar stools can also feature cushions, back rests, foot rests, swivel components, decorative designs, and more. Visit today. For a great deal on the finest barbecues, grills, and gas logs, visit Patio Place today. We offer Tustin customers the complete line of Fire Magic barbecues and grills, as well as high-quality barbecue replacement parts, such as range hoods, access doors, lights, and warmers. We can also convert barbecues from propane to gas (or from gas to propane). 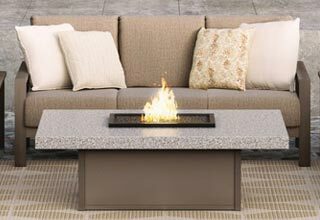 To complete your outdoor entertaining area, we also sell fridges, sinks, faucets, kegerators, ceramic gas logs, vented/unvented gas logs, reflective fire glass, river rocks, lava rocks, and various accessories for your Tustin fire pit, fire table, or fireplace. Patio Place offers affordable, professional cleaning services for your outdoor furniture in Tustin. With more than 25 years of experience, you can trust us to thoroughly clean your patio furniture using the best methods and techniques. Our patio furniture cleaning service can include vacuuming frames, washing the cushions, clearing surrounding debris, and more. If you are looking for an effective way to protect your furniture, we carry the top lines in patio furniture covers. We also custom-make covers in-house, which will perfectly fit your existing patio furniture, barbecues, and other equipment. All our covers are easy to fold and store and designed to last for years. Available at great prices, our standard and custom covers are a great investment. Call us today to learn more. Patio Place is known throughout Tustin for offering the best value on custom replacement outdoor cushions in Orange County. Our replacement cushions feature long-lasting, fade-resistant fabrics, skilled craftsmanship, and competitive rates. We can either design your cushions to perfectly match the ones you are replacing or design completely new ones using your choice of over 600 fabrics (from Sunbrella, Phifer, and manufacturers) and incorporating additional padding, zippers, and more. Most of our fabrics are warrantied against damage for years. Call today to learn more.